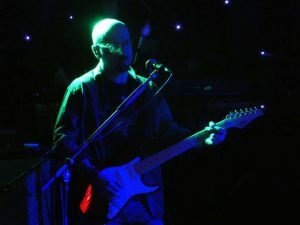 Andy has spent much of the last 30 years playing guitar in various rock covers bands in and around Peterborough, including ‘Picture This’, ‘Junkyard Dog’, ‘9 Lives’, ‘Atlantis’ and ‘Sidewynder’. Some of these bands included some original material written or co-written by Andy. He has also played in ‘Cold Sweat’, a Thin Lizzy tribute band. Americana is Andy’s first foray into Country music, having enjoyed listening to it since discovering American band ‘Little Texas’ on CMT in the 1990s. Andy’s primary musical influences are the great AOR rock bands of the 1980s and the guitarists who characterize the genre, including session greats Tim Pierce, Dann Huff, Mike Landau, Toto’s Steve Lukather and Bryan Adams’ guitarist, Keith Scott. Andy’s main country guitar influence is Keith Urban, although Dann Huff’s session work in 90’s country bands also figures prominently as an influence in Andy’s playing in Americana. All Andy’s guitars are set up by Jon Haire Guitar Services and have been for nearly 30 years. Andy’s approach to guitar tone starts with a great instrument and a great clean valve-amp sound. He then uses a variety of pedal combinations to colour the tone to suit the song, a technique currently used by American session genius Mike Landau.